Lemon Grass growing as clumps around the vegetable garden. You can use this as a border to keep the weeds at bay then, when it gets too big, harvest the leaves and use them as mulch – they deter pests. and have a multifunction, i.e. you can use them for more than one thing. Thinking about this concept is all part of the Permaculture story – stacking a space full of plants that are going to sustain us in more ways than one. 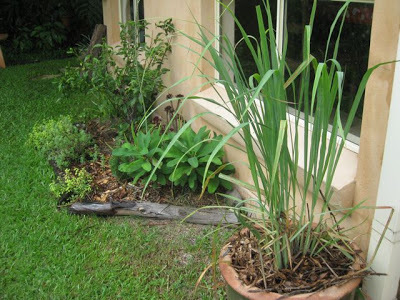 I recently went to a talk at the Mullumbimby Community Garden by Jerry Coleby Williams (from our national broadcaster, the ABC) about cornerstone plants for the future – lemon grass would be right up there with them in his book and my book. 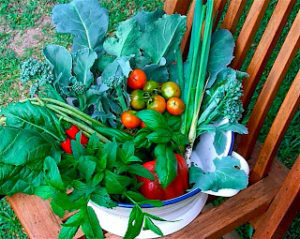 Why do I love this plant – because all parts are edible and it is very easy to grow AND – it is good for you. I have lemon grass growing pots around the place – in very handy spots – so that we can make tea from the leaves without having to go out into the garden – i.e. the torrential rain!! 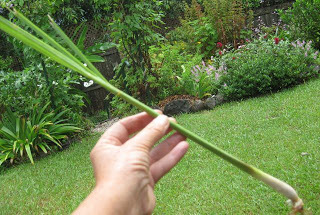 This is the part of lemon grass that you use in curries and soups – the white fleshy stem just above the root – the cut off leaves I use for tea. Food: a good source of vitamin A, the leaves can be used for tea, the stem bases are used in curries and Thai cooking & Vietnamese style salads. Also contains C, potassium, magnesium, iron & phosphorus. Lemon grass with mint is the favourite tea of this household – for adults and children alike. Medicinal: oil used as anti-fungal. Tea used for calming the stomach (with fresh ginger and mint) – teas also used for lowering cholesterol (University Wisconsin). Use cut leaves in muslin bag added to bath water. Edging: useful also as a barrier to running grasses around vegetable gardens. Attractive landscaping plant forming strappy lime green clump. Details: It rarely flowers. Harvesting for oil distillation begins when the clumps are 4-8 months old, it is subsequently harvested every 3-4 months, and this continues for about 4 years. The fresh grass yields 0.2-0.4% oil, giving 40-112 kg of oil/ha/yr. Propagation: By division in late winter. For clumps around the garden, close to the house, you may want to dig them up annually and divide them before they get too big. Where space doesn’t matter – just shear off all the leaves in late winter (use as mulch) and just let it re-shoot. Recipe: Dipping oil for bread. Store this in cool dark place for month shaking regularly. Click here to see the clever use of lemon grass as a satay stick – it flavours the meat and keeps it moist and your satay stick never gets too hot to handle! Thank you so much. Mosquitos love me, and now I know how to protect myself. Great smell of that grass, too. Super isea! Thank you Victoria – glad you found this information useful. As I am writing, the fragrance of a green curry paste I am making is wafting around – with lots of lemon grass added! It's such a useful pant. Excellent! 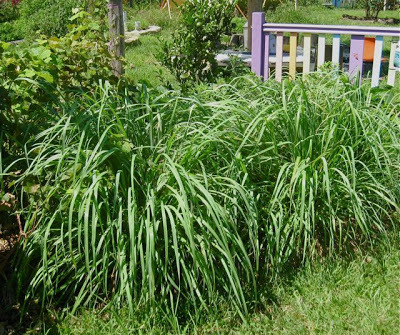 I did not know lemongrass could be useful as mulch for pest resistance and I the idea for putting it in bath water is STUNNING!!! It makes a great tea….simmer crushed stalks with ginger for a bit. Add stevia or sugar, chill and serve.